Trainees examine the back of a ground-mounted solar panel system. Solar’s benefits extend beyond the homeowners who are able to take control of where their electricity comes from and save money with a clean energy source. Solar development also creates good local jobs. That’s why as part of our Yampa Valley Solar Co-op, Solar United Neighbors is partnering with Solar Energy International (SEI) to provide free solar installer training to four Moffatt and Rout County residents. Thanks to an anonymous donor, Solar United Neighbors launched our first-ever Workforce Development Training Pilot this week. Four candidates were selected to receive training to earn their NABCEP PV Associate Certificate. This will prepare trainees for employment in the solar workforce. It enables them to demonstrate to prospective employers their understanding of solar installation and design. The sponsorship includes a week worth of in-person training at SEI’s headquarters in Panoia, Colorado along with online training and an exam. 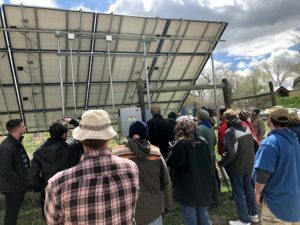 The four participants will support educational and partnership outreach for the Yampa Valley Solar Co-op into the early fall as part of their on-going solar training. As installs get rolling, they’ll be able to shadow or intern on-site with the solar co-op’s chosen installer. This will give them additional experience and set them up as qualified candidates for the growing solar industry. The selected candidates are: Colt Mortenson, Craig; Gene Leck-Deleon, Hayden; Bethani Massey, Steamboat Springs; and Matt Larson, Oak Creek. We’ll follow them along throughout the training process to share their stories and what they’ve learned. If you live in Rout or Moffatt County and would like to join the solar co-op, click here. The solar co-op is free to join and joining is not a commitment to purchase panels.